Road movies wherein a couple of characters hop in a car (or plane or train or other automobile) and go through life-changing experiences together can be a fun journey for movie lovers who join them for the ride. Road films of late, though, often have a distasteful potty humor bent to them, which — call me prude, if you must — I don't consider much fun. Yet road movies need not resort to toilet talk and trickery if the characters on the road to self-discovery are well-written, multidimensional folks doing their best to keep their dirty laundry sealed up in the heavy baggage they lug about. And if those characters have a reasonable — not raunchy — sense of humor regarding the secrets they're keeping from themselves as well as their travel buddies, all the better. The characters in MISSISSIPPI GRIND are all that and more. The independent film stars Ryan Reynolds and Ben Mendelsohn as two flawed and secretive gamblers who, though strangers at the outset, connect on a seemingly mystical level during a night of poker in small town Iowa. Gerry, a gambling addict who's down on his luck (and soon to be shaken down by bad, bad people), soon considers charismatic Curtis his lucky charm, the one who can pull him from the ruins he's made of his life. He sees a glimmer of hope in Curtis — who, in turn, hopes he may find peace and whatever it is he's searching for by assisting Gerry's redemption. On a whim — and out of Gerry's desperation — the two hop in Gerry's car and follow a route marked by gambling spots to earn the buy-in money for a big-time poker game in New Orleans. A game that could be the key to both achieving their dreams and becoming the men they long to be. MISSISSIPPI GRIND avoids cardboard characters of any sort. Not only are Gerry and Curtis interesting oddballs, the few women in the film are well-rounded, richly textured. Their time on screen is limited, yet Alfre Woodard, Sienna Miller, Analeigh Tipton, and Robin Weigert turn in powerful performances that, in mere minutes, reveal their unquestionable passion and power, pain, disappointment, and longing. Bravo to all! Bravo, too, to Anna Boden and Ryan Fleck, co-directors and co-writers of this moving and intelligent film that takes viewers on a soulful journey they won't soon forget. MISSISSIPPI GRIND was named one of the Top 10 Independent Films of 2015 by the National Board of Review, and Ben Mendelsohn was nominated for several Best Actor awards for his role as Gerry. I consider Gerry the main character of the film but I can't imagine his Gerry being half as good without Ryan Reynolds' Curtis as his partner. 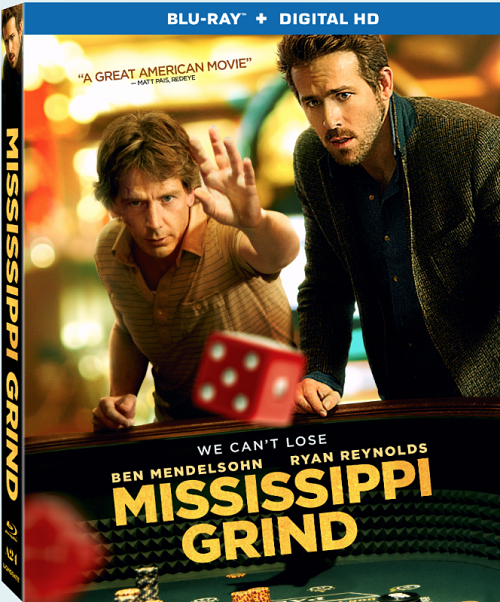 MISSISSIPPI GRIND (rated R for language) premiered at the 2015 Sundance Film Festival and is now available on DVD, Blu-ray, and streaming services.